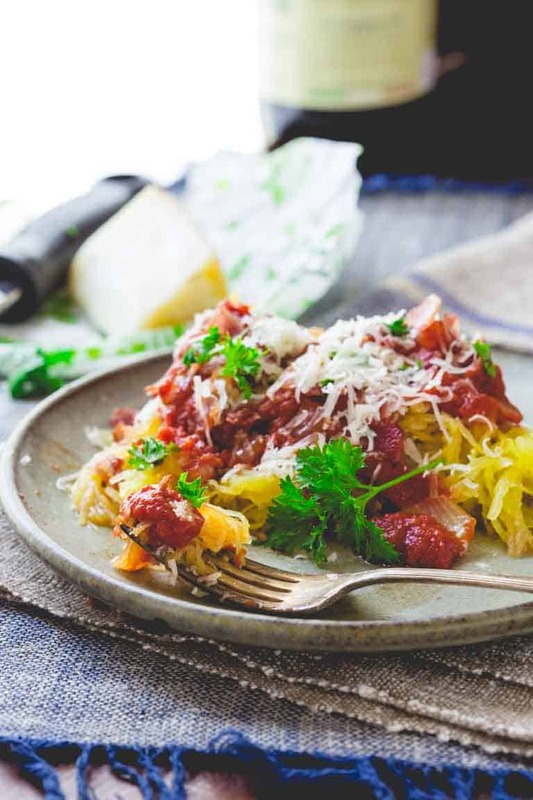 Here is a 30-minute, primal friendly, low-carb version of Spaghetti Amatriciana, made with spaghetti squash instead of pasta and bacon in the Amatriciana sauce instead of Guanciale. And I have a Great Big Bacon Giveaway! When we were in Italy last month, it was my younger daughter that ordered the best dish at every restaurant. Every meal we would try each other’s food and come to the conclusion that she had ordered the best meal out of all of us. The funny thing is that she always ordered the most simple, basic recipes, yet they always seemed to be the most delightful. The Bucatini Amatriciana she had on our first night in Florence was unforgettable. It blew us away in its flavorful simplicity. The rich slow cooked and salty pork flavor, the hit of hot pepper, the thick tomato sauce cooked right into the al dente noodles. The sharp Pecornio! Mmmm! When I got home from our trip and was thinking ahead to the fall and the recipes I wanted to share here, I kept thinking about that Amatriciana in Florence. I decided it would be a fun twist to serve the sauce with spaghetti squash instead of pasta. So to keep it simple and doable for a weeknight meal, I cooked the spaghetti squash in the microwave and made the sauce while that cooked. The whole thing came together in only 30 mintues. I also wanted to make sure that you wouldn’t have to make a trip to Eataly to make this, so instead of calling for the traditional Italian cured pork cheeks (Guanciale) that’s typically in Amatriciana, I used some American-style bacon. Vermont bacon, actually. Making Amatriciana sauce is deceptively simple—don’t let the bold flavors fool you into thinking otherwise! To make the sauce, first dice the Vermont bacon and place it into a skillet. Pop the skillet onto the stove over medium heat and fry until it’s browed and crispy. (You want to add the bacon to a cold skillet so that the fat renders off during the cooking process and coats the pan. This prevents the bacon from sticking to it!). Once browned, remove the bacon from the skillet with a slotted spoon and put it on a paper towel-lined plate. Drain the bacon fat from the pan and add in olive oil and red pepper flakes. Cook until fragrant, and then throw in the onion and cook until softened (your kitchen is going to smell amazing!). Stir in a can of tomatoes and let the mixture simmer until slightly thickened, which will take around five minutes. Once the spaghetti squash is finished, spoon the spicy Amatriciana sauce onto it and sprinkle with cheese. And speaking of Vermont Bacon… I have some for you! Like a giant box of it, and summer sausage and pepperoni and meat sticks!! Yeah giveaway time! Thank goodness you can’t see me embarrassing myself on the other side of the screen doin’ the meatstick dance! Check out the details for the giveaway below, prize provided by my buddies at Vermont Smoke & Cure! I heart them! Check ’em out on FB and Instagram. The prize is valued at $100 and includes 4 packages of uncured Vermont Smoke & Cure Bacon (2 of each flavor), 2 uncured summer sausages, 2 uncured smoked pepperoni and 2 boxes of meat sticks. All of which is made with meat that is raised without antibiotics or added hormones. Do you always try what everyone else orders at restaurants? Have you had Amatriciana sauce before? What would you do with the bacon in this prize pack? 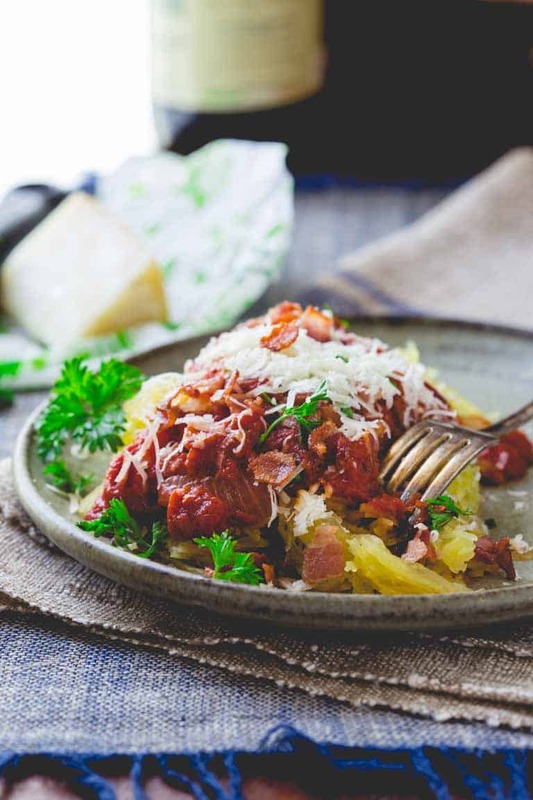 This spaghetti squash with amatriciana sauce is a 30-minute version of Spaghetti Amatriciana. This recipe is paleo and low-carb! Place spaghetti squash in a 9 by 11 baking dish, cut-side down. Pour one cup water in the pan. Cover with a layer of parchment or wax paper. Cover with plastic wrap. Microwave until the spaghetti squash pulls apart into tender threads when tested with a fork, 16 to 20 minutes. Meanwhile, place bacon in a large skillet and set over medium heat. Cook, stirring often until the bacon is browned and crispy, 6 to 8 minutes. Remove the bacon from the skillet with a slotted spoon and transfer it to a paper towel lined plate. Pour the fat off into a dish or can. Return the skillet to medium heat, and add oil and red pepper flake. Heat about 20 seconds. Add onion, and stir to coat with the oil and pepper flake. Continue cooking, stirring occasionally, until the onion is softened and starting to brown, 5 to 7 minutes. Add tomatoes and salt and bring to a simmer, stirring often. Simmer until the sauce has thickened slightly, about 5 minutes. When squash is tender, carefully remove the cover, and transfer the squash to a cutting board with tongs. Scrape spaghetti squash out of the shell with the forks. Add the squash and the reserved bacon to the sauce and simmer one minute. 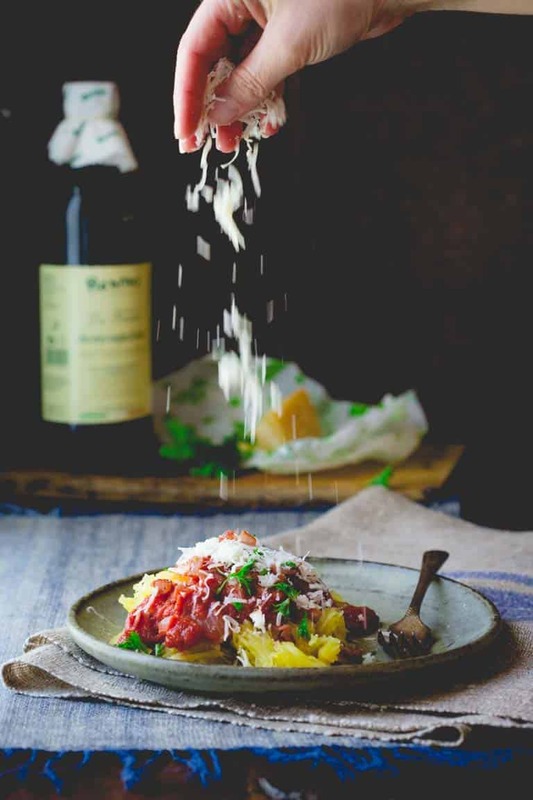 Serve the spaghetti squash topped with pecorino and parsley. We love Vermont Smoke and Cure — everything is better with bacon. I wonder what Italians think of gluten free eating. My husband and I usually have a friendly competition of who ordered the best dish- He did order this dish at least 3 times when we were in Italy this summer- Pinning so I can relive our trip! Dish looks amazing! Simple and beautiful. So many things I love about this…first of all, I love that your sister’s dishes were all the ones with the “simplest ingeredients”. Isn’t that always the case that the simplest dishes are the best? I love that you adapted this to the home cook and use bacon…and you tossed it over spaghetti squash! I’ll be making this dish for sure! This dish looks amazing! And those photos are fantastic. P.S. where is that awesome dinner plate from? I love the rustic look of it. Thank you Brynn. I bought it at an antique store. I am always on the look out for props. Especially ones like this with a bit of character. Glad you noticed. And thanks! This looks so delicious! Love everything about this dish! I would love to enter your sweepstakes! I love bacon! Wow, that looks fantastic! 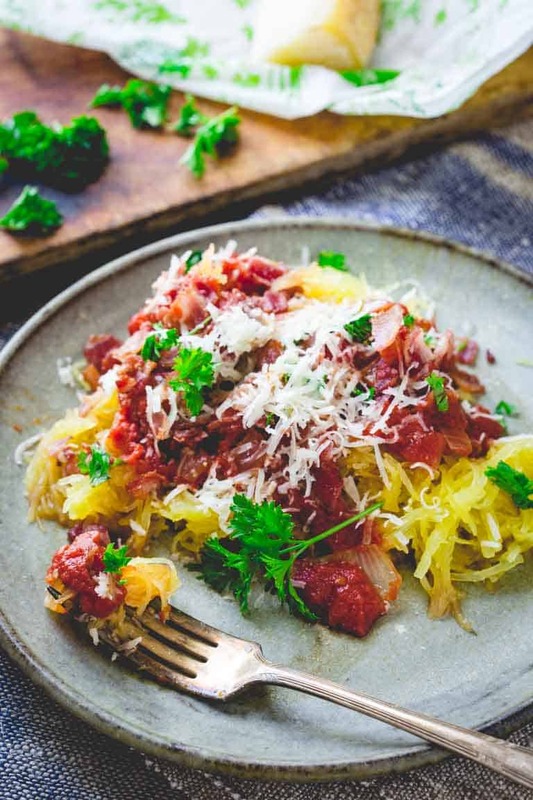 I love spaghetti squash…and bacon! Amatriciana sauce is new to me – I’d love to give it a try! I’ve never had Amatriciana sauce before, but I’d love to try it after looking at this recipe, especially with that bacon. i can’t wait to try this recipe! i’ve added all the ingredients to my next grocery list. i always try my husband’s food at restaurants and he tries mine as well. i’ve never heard of that type of sauce before, but i would love to try it! my kids LOVE bacon for breakfast, obviously and so do it – we eat it the usual ways with eggs or in breakfast tacos, but i also love throwing it into my lunch salads, etc. i’d love to try something new with it as an ingredient. My grandma used to make Spaghetti Amatriciana, but I haven’t had it in ages! So happy to see this healthy variation!! I love love love spaghetti squash and Vermont Smoke & Cure bacon! I so want to give this a try. Thanks for sharing! Saving this recipe to make this week! I’ve never seen their bacon in stores but this looks so good! In the past 6 months,I’ve had over 40lbs. of their bacon…..need I say more !!!!!!!!!!!!!! I knew Vermont was known for their Maple and now you’re telling me they have Bacon also…..that is perfect. 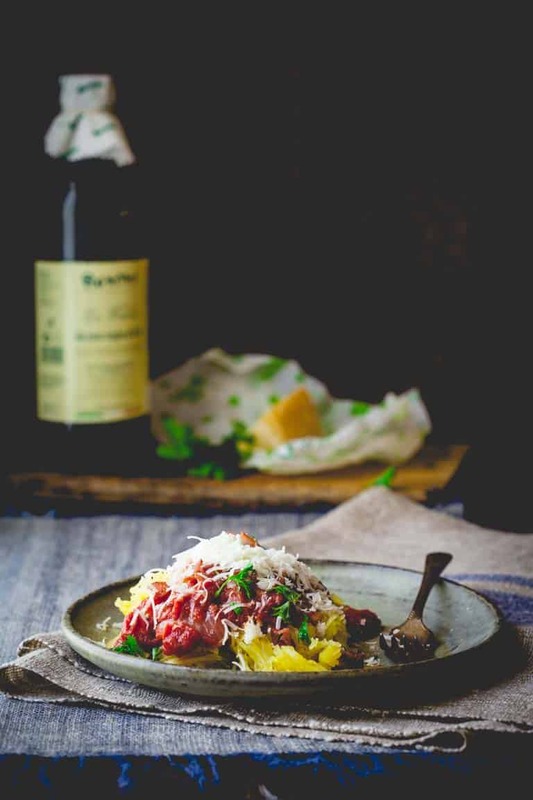 I love Spaghetti Squash, I think it’s such an underrated vegetable….goes so well with tomatoes and meat sauces. Thank you for the great recipe I’ll have to add bacon next time I make this. I’ve never had Amatriciana before but it sounds amazing. My fiance and I love putting bacon on everything so It would be used quickly haha! Hooray for sauce ‘alla Amatriciana (one of our favorites), with bonus points for the spaghetti squash as autumn nears! This looks similar to our go-to recipe, though I’m always down to swap out some or all of the pasta for a veg version. Excited to give yours a whack — thanks! First let me say I am a huge fan of bacon! These products look amazing and I would love to try them! I’ve never tried this brand, but I’m interested. Best meats in New England by far! And to top off an amazing recipe makes this almost supernatural! Looks like the perfect local Vermont meal! I didn’t know this company made bacon, but this meal looks delicious! I’ve had every flavor of their meat sticks so I am in love with their products. love vt smoke and cure and this looks awesome! We have tons of jalapenos in our garden so some of the bacon would absolutely get used for wrapping around the jalapenos that would be filled with light cream cheese!!! Super tasty!! And being a fellow Vermonter, I love supporting VT business!!! Love to try new things. Can’t wait to try this recipe. Would love to win your prize because bacon makes everything better. That looks awesome! Would love to win too! Yes!! I always try what my hubby gets. I have never had this sauce before but would love to try it. I would probably make this recipe. It looks delicious and would be a great low carb for my diabetic hubby! Thank you! This is going into the meal rotation pronto! Looks ahhhmazing! So glad to hear it Angie. Hop you enjoy it. 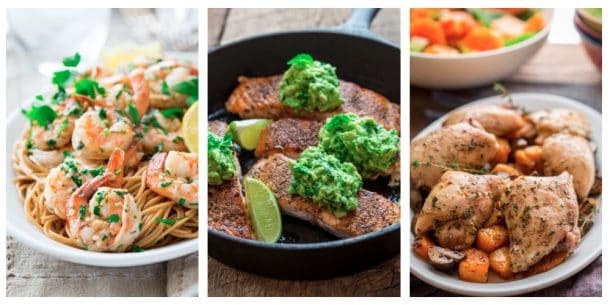 Love healthyseasonalrecipes.com. Already have a list of meals for September! You are too kind Kathy! Thank you so much. Have a great day. I do like subbing squash for pasta! And Vermont Smoke products are great. Thanks so much Sara! Have a great day. You made home-made beef sticks? That is incredible! Thanks so much for coming by to say hi Tina! Well, basically whenever I go out for a meal with my friend, I always let them choose or recommend restaurant and its food. Sometime it is interesting! 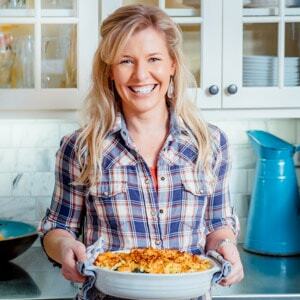 If I got bacon, no other choice, I will try this recipe for sure! SO tasty! And I love spaghetti squash as a pasta replacement, too!